Facing severe environmental and climatic conditions, life on the Eastern Front during WWII was extremely harsh during the winter. Add to this the fierce fighting between the two main protagonists – the Germans and Russians – and this turned into the largest and most brutal theater of war in human history. Combat was ferocious and destructive, with nearly half of WWII’s estimated death toll of 70 million occurring on the Eastern Front. More than 5 million Axis troops died, along with approximately 9 million Soviets, and up to 17 million civilians. The war on the Eastern Front was the most decisive of WWII, and it was primarily Russian resistance that brought about the eventual defeat of Germany in 1945. It is this momentous conflict that is reflected in the latest figure set from Dragon. The 1/35 set takes a novel approach in that it represents soldiers from both sides of the fighting. There are two Russian and two German figures – each prepared for the rigors of brutal combat on the “Ostfront”. To help them make it through the winter, the Germans and Russians are dressed in a variety of winter uniforms, with each item of clothing accurately represented in miniature. The four figures are carefully posed to give a natural appearance, and their degree of sculpting is very good. 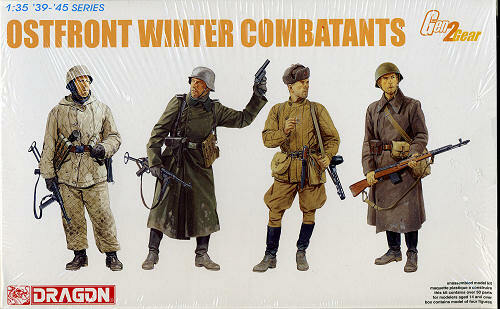 The soldiers are outfitted with a variety of weapons typically used on the Eastern Front. Each figure has its own unique characteristics, and they would certainly make ideal subjects for an individual vignette. On the other hand, there is no limit to how modelers and diorama-makers can employ them in a suitable winter scene somewhere on the bitter Eastern Front.